I want to share this recipe on my blog for the sake of its amazing taste. The outcome is lush and moist muffins. They are by far the easiest to make and super healthy. It uses, whole-wheat flour, All-Bran cereals, skimmed milk and a tiny amount of butter. Children relish them. I baked a dozen of Banana muffins today and their aroma permeated my kitchen. Mmmmm! I have to confess that as a food stylist I have to be embarrassed of how those muffins look like. They don’t rise like other do and the texture is a little lumpy. Well let’s say it’s more authentic like that:) But I do promise you a flavorful snack/breakfast, not too sweet but truly delectable. Soak All-Bran cereals in milk for about 10mn. Cream sugar and butter. Add Honey and egg. Mix well. Stir in the soaked milk gradually alternating with the flour mixture. Fold in the bananas and the raisins. Divide the batter into the muffin cases and bake for 20-25 minutes until toothpick inserted in the center of one of the muffins comes out clean. Cool for 5 minutes and remove from pan to a wire rack to cool entirely. 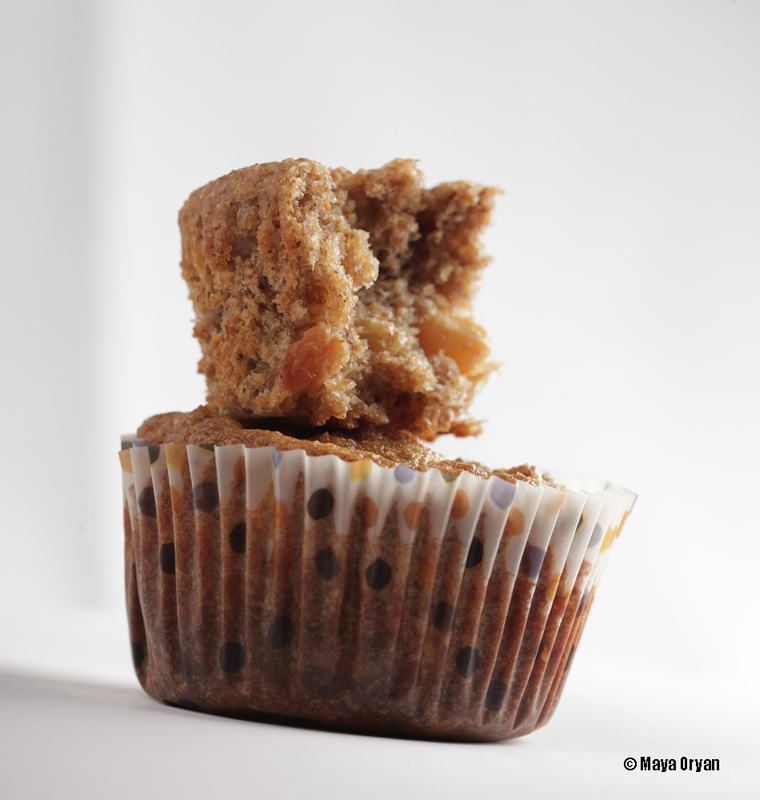 This entry was posted in Breakfast, Desserts and tagged All-Bran, Banana Muffins, Bananas, Children, Cupcake, Healthy, Kids, Maya Oryan, muffins, Whole-Wheat Flour, Wholemeal Flour by Maya Oryan. Bookmark the permalink. Sounds delish and great for kids! Two questions though, All Bran flakes or the original cereal (look like sticks)? And if I don’t want to put in raisins, can I put it an extra banana for the taste-factor? Lovely website! Thanks! Yes the sticks all bran and not the flakes. This recipe has a small amount of sugar, the raisin is there to add sweet to it. If you’d like to omit it I suggest that you increase the amount of sugar to half a cup.